Everyday Recipes - great food made easy! Party food is big for the Super Bowl. Wings, nachos, dips, pizza; all centre around this sporting event. I wanted to make some kind of dessert or cookie for the occasion, then I decided on cupcakes. Cupcakes are great because you get a lot of sweetness in a small package! And there's always room for a cupcake. This particular recipe was for chocolate cupcakes. I liked the denseness and intense chocolate flavour in the finished product. The only chocolate in the recipe is cocoa. They are easy to make and mix up in one bowl. The recipe makes about 20 cupcakes. 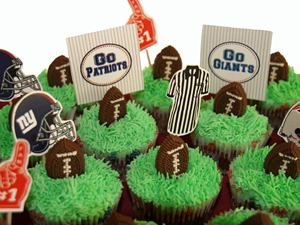 I used football cupcake liners, iced them with green buttercream icing and added a candy football (purchased at Bulk Barn). For the football picks, I downloaded the free pdf from 9to5mom blogspot. You can then cut out the individual logos, etc and attach to a toothpick with glue or tape before inserting into the cupcake. 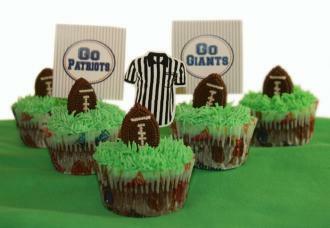 These would also be great for a boy's birthday party. Preheat the oven to 350°F. Line muffin tins with the liners. Sift all dry ingredients together. Add eggs, water, buttermilk, oil and vanilla and mix together until smooth. Fill cupcake liners 2/3 full. Bake for approx. 20 mins. Mix all together. If icing appears too dry add a little more milk. Colour with green gel food colouring. I used the Kelly Green colour gel paste from Wilton® to achieve the green colour. I used a tip 233 for the grass. Cover the cupcakes first with a spatula of green icing then add grass. Add football candy and picks. Enjoy! Mom, wife, baker, cook and lover of every cookie cutter and kitchen gadget there is, that's me!